The other day I saw a movie adaptation of Shakespeare’s Merchant of Venice, with Al Pacino playing Shylock. The other day I saw a movie adaptation of Shakespeare’s Merchant of Venice, with Al Pacino playing Shylock. Ever since I first studied it in school, I’ve found it a deeply problematic play. As a schoolchild I had yet to encounter the concept of anti-Semitism, though I knew about the Nazis and the bad things they’d done to the Jews. The Calcutta of those days had a small but prosperous Jewish community. No one would have dreamt of discriminating against them, let alone persecuting them; they were so tangential to the concerns of the majority. My first problem with the play as a schoolboy was that it took me a while to realise that the Merchant of the title was Antonio: an insipid Sad Sack regrettably besotted by the bisexual gigolo, Bassanio. I felt that Shylock should have had the titular billing in the play. He was by far the most compelling among the dramatis personae. Even Portia, her “Quality of mercy” speech notwithstanding, couldn’t steal the play from him. For me, and for a lot of others, Shylock has always been the true protagonist of Merchant of Venice. Which is why I—along with many critics who are far more discerning—have found the play so morally ambiguous in our post-Holocaust age. In Shakespearean times, anti-Semitism—unabashed Jew-baiting—had already a long tradition both as popular sport and political expedient across Christendom. Majoritarian folklore depicted Jews as bogeys, who poisoned wells and used the blood of Christian children to leaven their sacramental bread. They were seen as the people who’d put Christ on the cross, so obviously they must be evil (never mind the inconvenient Jewishness of Christ himself). In Christian doctrine, until the Jews accepted Christ as the Messiah, the day of final judgment, when the faithful would be rewarded with heaven and the sinners (ie all non-Christians) sent to the other place, would be indefinitely postponed. Prohibited from owning property, the Jews perforce were an itinerant people, a nation without a country, some of whom became moneylenders out of necessity if not monetary aptitude or preference. The image of the blood-sucking usurer further demonised the Jew, the perpetual alien. 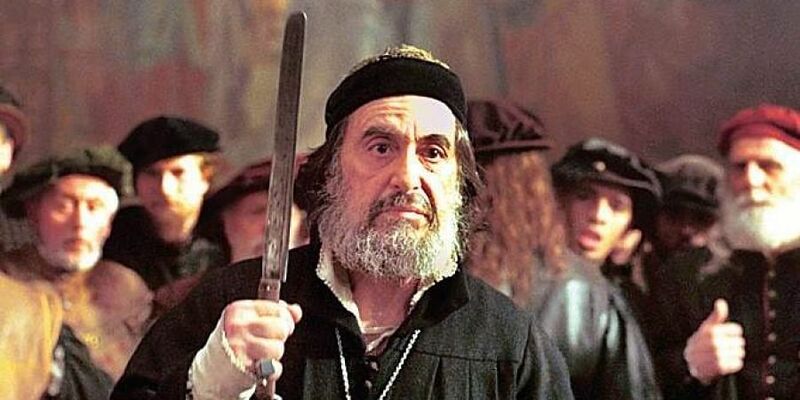 Merchant of Venice was a remake, so to speak, of Marlowe’s The Jew of Malta. But while Marlowe’s Barabbas was a caricature of a villain (even as seen by audiences of the time), Shylock was even then too real, too human. Did the character of Shylock, as some have suggested, run away with Shakespeare, as Lucifer ran away with Milton in Paradise Lost? Whatever the cause, the effect must have been discomfiting even for a Shakespearean audience. When, after being thwarted of his monstrous revenge, the all-too-human Shylock, an old, broken husk of a man, is forced on pain of death to renounce Judaism, to abjure his very soul, the groundlings might have cheered. But the more percipient (including the dramatist himself) must have been left with a disturbing moral question: Was Christian virtue based on vengefulness as implacably inhuman as that of Shylock the Jew? In the post-Holocaust age the play becomes unplayable, even for many non-Jewish viewers. In the modern West-oriented canon at least, the Holocaust is the ultimate horror, the benchmark of victimhood, of man’s inhumanity to man. The H-word is used to rate atrocities as unrelated and disparate as Pol Pot’s genocide, Bosnia, and the post-Godhra riots in Gujarat. In a cruel paradox, the Holocaust has become Israel’s moral imperative to justify dispossessing the Palestinian people of their land, and in effect of their soul, in the name of the slogan ‘Never again’. By a geo-political sleight of hand, Israel—the most heavily armed country in West Asia—has sought identification with the persecuted Jewish nation, an identification many non-Israeli Jews would question. Equally, the sinister Jew who deserved his harsh comeuppance in Shakespearean times has for many, including those in the non-Arab, non-Muslim world, been replaced by the war-mongering Sabra. What if Merchant of Venice were reprised as political theatre in which a Zionist resident in an Islamic country were, through goad of constant provocation, to plot a mortal conspiracy against a Muslim citizen, be tried under local law, be forced to concede the right of Palestinians to their land, and in effect renounce exclusivist Zionism? And what if the Zionist in this case were to be depicted with the ambiguity of Shakespeare’s Shylock, a man certainly sinning, but perhaps only so because he had first been sinned against? How would an Islamic Portia’s discourse on the universal quality of mercy go down in Tehran? Or for that matter, in Tel Aviv. The ends of political justice would not be met. But the means of poetic justice might at least be served. And Shylock’s unquiet ghost at last be laid to rest, in everyman’s promised land of reconciliation and redemption.